Aloe Up products contain more PURE Aloe Vera gel than other similar products on the market, ranging from a minimum of 35% by volume up to 96.9% by volume. In addition to its healing properties, Aloe Vera has the same PH as your skin. This allows our Aloe-based Sunscreens to quickly and effectively soak into your skin to prevent sunburn and a greasy skin layer. Prickly Heat, Biodegradable & Reef Friendly. 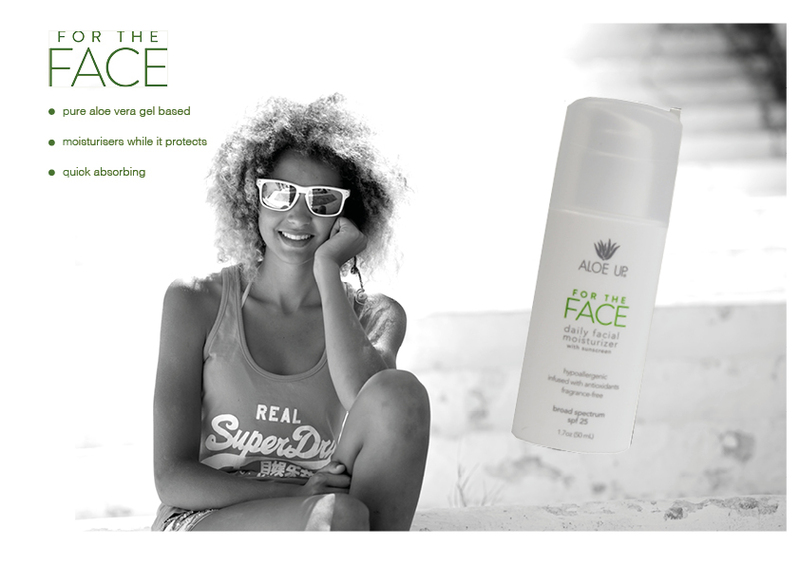 Moisturises & rehydrates your skin while it protects. Aloe Up suncream formulas do not contain Mineral oil or water. They replaced these ingredients with AloeVera gel...35% by volume. Dry non greasy and same PH as skin. Less aggitation to sensitive skin. Popular for Prickly Heat sufferers. When Spring arrives you can feel the heat of the sun. Time to protect yourself from harmful UV rays and build a safe tan. Ocean & Reef friendly because AloeUp is biodegradable. Water resistant for long hours of Broad Spectrum UVA/UVB protection the equivalent of a 5-Star rating. No nasties, Paraben and Oxybenzone FREE Suncreams.